A GRACEFUL FOOTBRIDGE NOT FAR FROM the main drag in Bridgton is a great learning test for anyone who thinks they know Maine wood. Entering the timber frame structure, the eye is drawn to a “live edge” of bark on the overhead cross ties. There is smooth bark and deep-fissured bark, whitish bark and reddish bark, flaky bark and ridged bark, mottled bark and patterned bark. In all, 16 cross ties, each made from a different Maine wood. 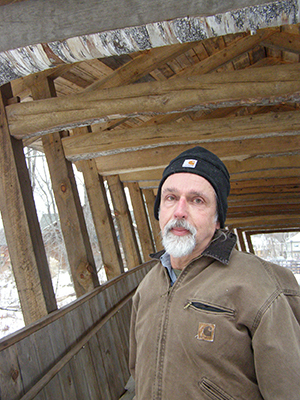 The bridge—which spans Willett Brook at the entrance to Pondicherry Park—is a memorial to the late Bob Dunning, a beloved restoration carpenter, community leader and environmentalist. 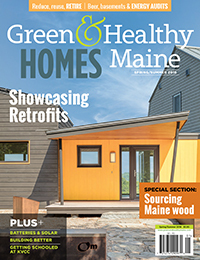 Getting timbers from 16 kinds of trees was a treasure hunt and labor of love. Most of the wood is not available at any lumber yard and some species are uncommon. The spirit of the bridge certainly resonates with Alanna Doughty, an educator at Lakes Environmental Association. Doughty says she is “so glad” that the wood is not labeled. She recently showed the bridge to a visitor to town and they enjoyed matching tree identification skills. “I certainly appreciate the challenge,” she said. “It was really fun."